Zoëtry Paraiso de la Bonita Riviera Maya Wins the AAA Five Diamond Award for the 13th Consecutive Year! Congratulations to Zoëtry Paraiso de la Bonita Riviera Maya for earning the prestigious AAA Five Diamond Award for the thirteenth consecutive year in a row! 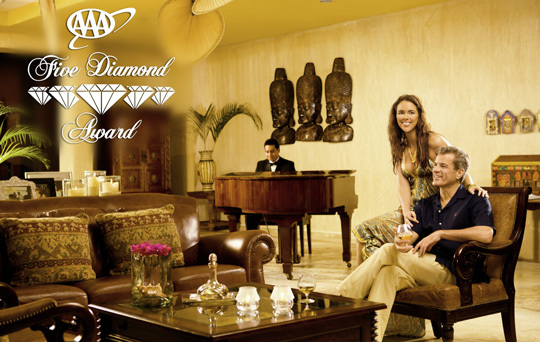 The AAA Five Diamond Award is given to resorts that exceed the highest standards of overall quality, range of facilities and level of services offered on property, based on rigorous AAA standards. For the 13th consecutive year, Zoëtry Paraiso de la Bonita Riviera Maya was proud to receive the illustrious AAA Five Diamond Award! For more photos of the celebration, click here. Now, it is our honor to announce AAA’s recognition of Zoëtry Paraiso de la Bonita Riviera Maya with a Five Diamond rating, for the eighth year in a row! The recognition marks the eighth consecutive year the property has received the Five Diamond rating, the longest streak in Mexico’s Riviera Maya region. This rating acknowledges this unique, boutique resort as one of North America’s most luxurious accommodations. Less than 0.25% percent of the over 31,000 properties approved by AAA ever achieve this prestigious distinction! In fact, Zoëtry Paraiso de la Bonita is one of only 103 lodgings to earn the Five Diamond recognition from the leading travel authority. A listing of Zoëtry Paraiso de la Bonita is accessible on AAA.com and will appear in the 2012 edition of the AAA Mexico TourBook® guide. We owe a big thanks to AAA for their support and recognition, as we continue to pamper our guests with the most exquisite luxury vacation they can experience!